After successfully funding his horror adventure Asylum via Kickstarter in 2013, Argentinian developer Agustín Cordes is now returning to crowdfunding once again for his latest adventure. Endowed with the first-ever official H.P. Lovecraft license for a videogame, The Case of Charles Dexter Ward is in serious need of public support to turn its horrors into reality. With so much riding on the impact of the next week, I caught up with a very busy Agustín to learn more about this promising project, as well as the current status of Asylum. Ingmar Böke: Hi, Agustín. It’s my pleasure to interview you again. When you first told me about The Case of Charles Dexter Ward and the plan to go on Kickstarter, my initial reaction was: “is it really a good idea to do that before you deliver Asylum?” I’m sure many others are now thinking the same thing. Please talk about your feelings regarding this potential conflict, and why the Kickstarter has to take place now. Agustín Cordes: Hey Ingmar, glad to be an interviewee again. Unfortunately I can’t commit to vast and seemingly illimitable answers because of the ongoing Kickstarter, but I’ll do my best! Game development is a tricky craft, and transition between projects is one of the worst problems we developers must face. There’s many different actors in a game project: artists, designers, programmers, and more. Some of them finish their work earlier than others — crucially, it’s almost a given that in any game project the artists will finish work before the programmers, and keep in mind that there’s a lengthy period of beta testing as well (or at least there should!) even after most programming has been completed. This poses a complicated situation, especially in a mammoth game like Asylum: what do the artists do while we finish programming the game? There can be a gap of several months if we take into account the testing phase, and the situation gets even trickier if you consider that from the moment the game goes on sale it can take a while until you start recouping money to sustain an entire team. Thus, it makes loads of sense, even for a small company like ourselves, to have two projects overlapping. Especially because Asylum is an ambitious and complex game that will demand more time to complete and fully test, even when we’re finishing work on the graphics. So we need this new project to ensure the continuity of the whole Senscape team, and it’s the ideal moment before we enter crunch mode in Asylum. And believe me, that will be an epic crunch! Ingmar: We talked about Lovecraft quite a bit in our last interview, where you shared your strong connection to the master of cosmic horror. 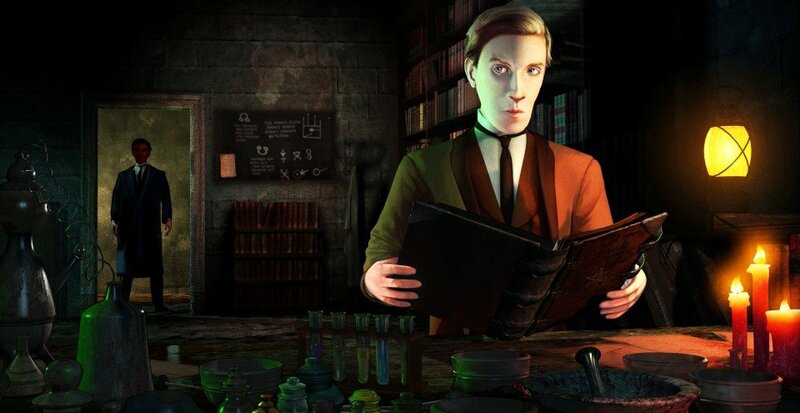 How did you manage to get the chance to do an official Lovecraft game? And what will working with this particular license mean to you personally? Agustín: Well, it’s a dream come true to work with an officially licensed H. P. Lovecraft game, to say the least, especially when the story in question is The Case of Charles Dexter Ward, one of my favorite ones and among the richest he wrote. It feels unreal to keep the master of supernatural and cosmic horror relevant like this, and no less through the adventure genre. The negotiation to secure the license took months and was excruciatingly slow. For a long time I thought it would never happen. I believe that our track record, with well-received Lovecraftian games like Scratches and the success of Asylum, was crucial to make this deal happen. It was S. T. Joshi, the man responsible for editing the definitive Lovecraft texts with revealing annotations, who put me in touch with the Lovecraft Estate in Providence. Ingmar: The Kickstarter goal of $250,000 is quite ambitious, and obviously you’ll need a LOT more backers than for Asylum. What’s your plan for attracting these people, and where do you plan to find them? Agustín: It is ambitious, yes, but we want to do justice to the source material and deliver an adventure game that surpasses the already high expectations. Plus, we must pay for the license, so we couldn’t settle for anything lower. So far the game has had incredible exposure — its announcement went viral and my cellphone wouldn’t stop beeping with notifications of retweets and likes for an entire day after the news broke. We raised $10,000 in under four hours — to compare, Asylum required a full day to reach that amount. However, Kickstarter is a strange beast these days and we’re having a bumpy ride. We’ll keep pushing Charles Dexter Ward no matter what, because clearly people want this game. Ingmar: We talked before about previous Lovecraft games not really capturing his spirit in terms of a fear of the unknown. In what way are you trying to achieve that and do Lovecraft’s vision justice? Agustín: I’ve been discussing this at length in the Kickstarter campaign. Lovecraft is not just about fear of the unknown but a solid mix of supernatural and cosmic horror. Too many Lovecraftian games are quick to get “physical” and demand players to fight enemies or escape a nasty fate. As I’ve argued in the past, anything that forces you to confront an alien creature or monster is categorically not Lovecraftian. In his stories, the human race is so insignificant that it can’t possibly grasp the notion of these otherworldly entities that are as old as the cosmos itself, let alone attempt to kill them. Many adventures have succeeded in bringing supernatural horror to games because it’s indeed the ideal genre for non-physical horror, but few (if any) have incorporated the type of cosmic horror developed by Lovecraft. This subgenre must embody a fear of outer space, be very pessimistic, and should present humans as mere unimportant toys in the scheme of great forces beyond their comprehension. These are the traits that we’re embracing in Charles Dexter Ward, which turns an idyllic Providence into a parade of abhorrent influences from the past and nightmarish horrors crawling underground. Ingmar: Not everyone will be familiar with the original Charles Dexter Ward story, so please give us a quick summary of the plot and introduce the title character. Agustín: The story was Lovecraft’s most personal work and definitely remains among his best, most enduring creations. It’s quite a gruesome tale by his standards as well. The Case of Charles Dexter Ward was written during his most creative period when he returned to Providence after a dreadful stay in New York. That busy urban life was too much for his sensibilities, and the story is partly an ode to the dreamy and colonial life in Providence. Moreover, along with the The Call of Cthulhu, it features the germ of the so-called “Cthulhu Mythos”, which became massively popular. For example, Yog-Sothoth was first mentioned in Charles Dexter Ward and even has a very important role, so the novel is of special interest to fans of Lovecraft. As was often the case with other remarkable creations of his, Lovecraft hated it and never cared to publish it, making this the most important work to be published posthumously. The story itself revolves around Charles, a student and daydreamer who spends most of his days researching local history, genealogy and architecture. During one of these excursions, he realizes that he’s a descendant of an apparent wizard – Joseph Curwen – who escaped the witch trials in Salem and sought refuge in Providence, eventually holding a tight grip on its commerce for unspeakable reasons related to occult arts. Charles becomes so obsessed with Curwen that he goes on a quest to raise him back from the dead by securing his “Essential Saltes” and a dusty copy of the unhallowed Necronomicon. It’s an exciting and stimulating tale from beginning to end, and these two characters – Charles Dexter Ward and Joseph Curwen – are by far the most interesting ones imagined by Lovecraft. It’s ideal for an adventure game adaptation, too.